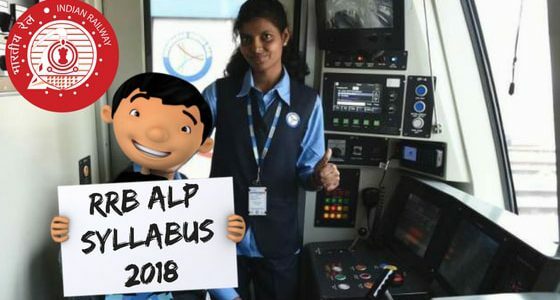 RRB ALP Syllabus 2018: RRB ALP complete syllabus pdf is available here. you can start preparing for exam through RRB Assistant Loco Pilot Syllabus. The recruitment process of RRB ALP & Technician includes First Stage RRB ALP CBT Syllabus, Second Stage CBT Syllabus, Computer Based Aptitude Test and Document Verification. RRB Assistant Loco Pilot Syllabus (Group-C Syllabus) will help the candidate for preparation of RRB Exams. However, The exam dates have not been declared yet. It is expected that the Exam will be conducted in the month of August 2018. 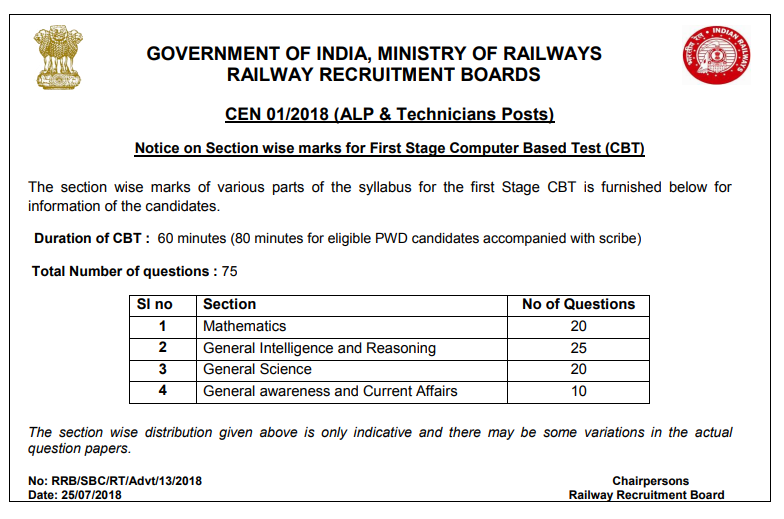 RRB ALP Exam Date has been released in the month of July 2018. In this article, we have shared some essential information regarding the RRB ALP 2018 Syllabus PDF. This will help the candidates to start preparing for their RRB ALP 2018 Examination. RRB ALP notification has released. Railway Recruitment Boards of Indian Railways is providing around 26,502 Vacancies for both RRB ALP (17, 673) and RRB Technicians (8829) Posts. RRB ALP Online Application form 2018 has been started from 28th Feb 2018. Online Registration for RRB ALP ends on 31st March 2018. The first round CBT is common for both ALP (Assistant Loco Pilot) and Technician. The total time duration of the Examination is 60 Minutes. Number of Questions asked- 75 questions. The questions will be objective type with multiple choice questions. General Awareness of Current Affairs. RRB ALP Previous Years Paper check here. Number System, BODMAS, Decimals, Fractions, HCF and LCM, Ratio and Proportion, Percentages, Mensuration, Time and Work, Time and Distance, Simple and Compound Interest, Profit and Loss, Algebra, Geometry, Trigonometry, Elementary Statistics, Square root, Age Calculations, Calender and clock and Pipes and Cisterns etc. Analogies, Alphabetical and Number Series, Coding and Decoding, Mathematical Operations, Relationships, Syllogism, Jumbling, Venn Diagram, Data Interpretation and Sufficiency, Conclusions and Decision Making, Similarities and Differences, Analytical Reasoning, Classification, Directions, Statement- Arguments and Assumptions etc. RRB ALP syllabus under this will cover Physics, Chemistry and Life Sciences of 10th Standard Level. Science and Technology, Sports, Culture, Personalities, Economics, Politics and other subjects of importance. RRB ALP syllabus for Mathematics, General Intelligence and Reasoning and General Awareness are same for both First and Second Stage CBT except Basic Science and Engineering. Engineering Drawing (Projections, Views, Drawing Instruments, Lines, Geometric Figures, Symbolic Representation). Syllabus of CBT 2nd Stage Part B is available on DGET website. SIR MAY I APPLY IN TWO RRB (W.I. MUMBAI AND AHEMDABA) AT A TIME? I done engineering in Industrial & production Branch So which branch shall I select in ALP degree category? & which option should I select between HSSC & Matriculation? if we have select fitter trade than questions in second exam are coming from only fitter trade and what syllabus for loco pilot. I Have completed BE Mechanical Engineering. Please suggest me the position I can apply? Sir maine btech mechanical se kia h to jo technical syllabus h wo har trade ka padhna padega mujhe ya bs jo subject bhara h uska? Hi sir I completed 10+2 and diploma electronics,am i eligible of technician and alp both posts? Plz tell me sir. Sir, I have completed B-tech IT and also MBA in Marketing (corr.). Is there a job that i can apply for..
i have completed my 10+2 can i apply for loco pilot? Yes you can apply as last date is 31-3-2018. Check online and go ahead. I complated 10+2 with phys chemistry and math..i want to apply for technician post. but i ware eye glasses…and my glass power is -1.5 ..may i eligible for tecnician post??? I HAVE DONE GRADUATION IN COMPUTER SCIENCE, SO I CAN APPLY FOR THIS POST. REPLY ME AS SOON AS POSSIBLE.